Deck Maintenance to Prepare For Making Memories This Season - Harmony Decking - Building Decks in Bucks, Montgomery County & Beyond! Imagine your deck as a boat, protecting anyone on it from the dangers of the deep blue sea. We bet you’d be extra cautious about preparing it for a several months long voyage. Well, then why is it we often only give our decks a cursory glance before expecting them55 to hold up to the spring and summer seasons? Join us for deck maintenance 101. Focus on the Foundation: Look closely at the foundational beams, especially where they meet the ground. As moisture can be trapped here, these areas tend to weaken sooner than others. While you’re completing each of the other inspection points, check the wood in each area. You can do this by taking a skinny sharp tool, such as an ice pick to any seemingly weak area. If the ice pick pokes through the wood, you’ve probably got rot and decay. Scrutinize the steps: Take care to stand and even bounce on the balls of your feet on each step. If any of the stairs feel wobbly or weak beneath your step, you likely need to replace boards and screws. Concentrate on Joints and Fasteners: These areas are key to your deck’s support, so they take a lot of pressure. It’s important to look closely for splitting at the joints and rusted fasteners, such as screws, nails, and bolts. Examine the Flashing: The flashing is a waterproof material installed where the deck is attached to your house. It protects your home from water damage, rot, and decay. This often overlooked but frequent flier in the area of safety concerns deserves extra attention. Scrutinize the Railings: Wobbly, split, or broken railings need immediate attention. These railings protect you, your family, and your guests from potentially serious falls and injuries. Not sure about whether or not your deck needs minor repairs or massive overhaul? Contact our expert team at Harmony Decking. We are experienced in building durable, dream decks that require less deck maintenance that standard wood. Make Sure Your Deck Is In Check This Year! Deck season has surely arrived. But before you fire up the grill and kick your feet up, these key tasks need to be checked off your deck-to-do list. 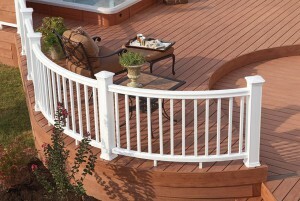 Call Harmony Decking today for your appointment to ensure your deck is safe. Before you know it, you’ll be prepared to set sail to your deck destination.